Find the 2018 Halloween haunted houses in Louisiana. Funtober has the most complete list of haunted attractions including haunted corn mazes, haunted trails, haunted houses, scream parks, and more. Louisiana attractions have the best vampires, ghosts, ghouls, and zombies running around at Halloween. Do you run a haunted house in the United States? Please see our advertising page or contact us for more information. Plan a night out with your friends at one of these fun haunted houses shown below. We update our list with the most complete dates, times, locations, and prices shown on the internet. October is a great time for Halloween scary fun. We have separate attraction links and listings for haunted houses USA, haunted corn mazes, haunted trails, haunted zombie paintball, haunted forests, haunted hayrides, and ghost tours. Evil Visions opens on October 5th. Ever been in a coffin? The Coffin Ride at Evil Visions Haunted House gives you the opportunity to go from the funeral parlor to the grave. 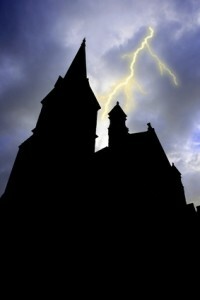 The Haunted House attraction provides a portal into the evil darkness. Friday and Saturday night hours are 7 pm to 12 a.m. It runs every Friday through Sunday nights. 13th Floor present the all new New Orleans Nightmare. They are located at the former House of Shock location. They are open every Friday and Saturday starting September 21st. They also are open most nights the two weeks before Halloween. Tickets range from $19.99 to $29.99. Lots of combo’s and VIP’s available. Attractions are Slaughterhouse 3D, Mini Escape, Museum Macabre and Cursed VooDoo. The Rise Haunted House story features a hidden laboratory where wild experimentation was performed to create the walking dead. There are two haunted attractions totaling 10,000 square feet of fear. The Dark Souls Haunted House unleashed the dark souls that invite you inside. Next is the Operation Deadly Assault Zombie Paintball which features a paintball hayride as you hunt the undead. Doors open at 7 pm. Doors open for the season on September 28th. They are open most Thursday through Sunday nights in October. Do you like snakes? The 13th Gate has live snakes, a crematory oven, a 40,000 square foot haunted house, 13 indoor and outdoor scenes, and about 100 scary actors. This is one of the best haunted houses in Louisiana and for years one of the best in the country. Tickets are $30. Doors open at 6:30 pm. The 13th Gate has opening night specials online. This is one very scary haunt. Consider it on the extreme side. The people who run 13th Gate also run Necropolis 13 across the street. See both attractions for $35 on the same night. It is a separate attraction using the same ticket booth in the area. This made the Funtober Favorite 100 list of the top 100 most popular haunt attractions in the country. 13th Gate has over 104000 Facebook likes. The Haunted Ship is back for 2018. The USS Orleck was built in 1944. It is now a naval museum that turns into one of the most scary haunted attractions in Louisiana. They still have their museum tours and blacklight laser tag events. Opens starting September 28th. They run every Friday and Saturday night in October. Tickets are just $15. After 25 years the very popular The House of Shock has permanently closed. At the same location is a new haunt owned by the nationally popular haunt group 13th Floor. They will be known as New Orleans Nightmare. We list them as a separate haunt. The Mortuary City of the Dead opens September 22nd from 6:15 pm until 11 pm most nights. They prey on the various fears and phobias that scare people. Expect to become terrified. Tickets are $30 for general admission. There are other ticket options and specials on their web page. Open every Friday and Saturday nights in October plus lots of dates near Halloween. Check their web page. Since The Mortuary first opened its doors as a haunted attraction in 2007, it has been featured on the top ghost hunting shows including Discovery Channel’s Ghost Lab, Syfi Channel’s Ghost Hunters & Ghost Hunter’s International, The Travel Channel’s Ghost Adventures and featured as one of America’s Scariest Attractions! It’s the perfect setting for a one-of-kind adrenaline pumping, nail-biting haunted house experience! The property is surrounded by actual graveyards known in New Orleans as “The Cities Of The Dead.” Now add to what is undoubtedly a very scary environment to begin with, state of the art animatronics, theatrical sets, movie quality makeup, over-the-top special effects, unusual themes and details adds up to experiencing one of the most terrifying Halloween haunts ever. The haunt opens September 28th this season. This is a Louisiana horror trail that takes about 45 minutes to walk through. They also feature a separate Zombie Hunt and Clown House. Tickets are $10-20 per person for each attraction or $40 for a combo ticket. Gates are open from 7 pm until Midnight most open nights. They are open every Friday and Saturday plus additional nights before Halloween. If you are too far from New Orleans to make it there for Halloween, perhaps it would be quicker to visit a haunted house in another state. Consider these states in addition to the Louisiana haunted houses. Have you been to one of these haunted attractions? Future readers would be interested in hearing what you thought. Did you have a great experience? Was it worth the price? Would you suggest it to our readers? Any tips to maximize your experience? I’ll gladly publish what you send me and give you a virtual hug. If you are the owner or employee of a haunted house in this directory, or one I missed and need to add, I would love to have more information about the haunted house, photos, dates/times/hours for 2018, etc. Use the contact form to get in touch and I’ll tell you where to email your answers to these questions. This list is missing the Fright Trail in Scott, LA.